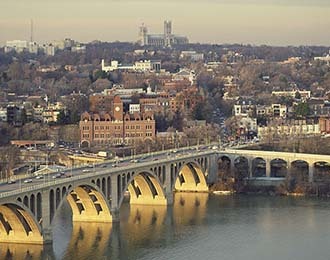 The Georgetown Neighborhood is the oldest populated area in Washington DC. Founded in 1751, the port of Georgetown originally sparked trade and commerce along the Potomac River, but has evolved into one of the most unique cultural and historic centers of Washington DC today, with Georgetown University right in the middle. Much of the architecture is antiquated and preserved, and some streets are still made of cobblestones. The main streets today are M Street NW and Wisconsin Avenue NW, and are lined by restaurants, bars, high end shops, and the Georgetown Waterfront. George Washington himself used to frequent the area, and many of the same places still exist today, including Suter’s Tavern and the Old Stone House. Other famous residents include but are not limited to Thomas Jefferson, Francis Scott Key, Robert Todd Lincoln, Alexander Graham Bell, and even John Fitzgerald Kennedy. Georgetown is not accessible by the Metro train system, so plan accordingly when trying to visit the area. We are working on a Georgetown walking tour, so look out for it this Spring!